Investigation into long term effects of exercise intervention utilizing jaw mobilizing device on trismus in HNC patients. Concluded that jaw mobilizing devices produce positive outcomes that persist over time. 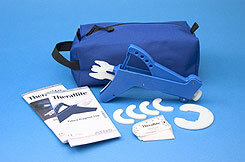 The TheraBite's positive effects on maximum interincisal opening and health-related quality of life factors.